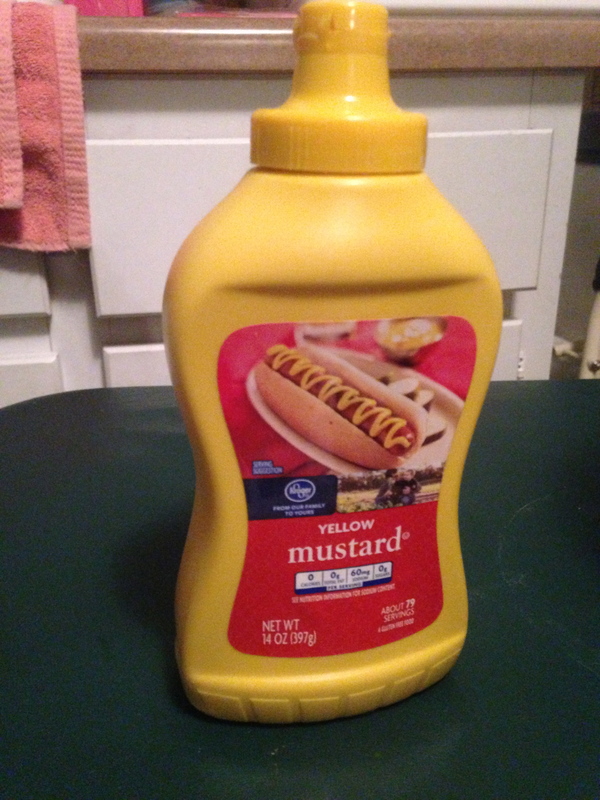 Why am I posting a picture of a bottle of mustard? Just hang in there with me for a minute. A few nights ago, I was needing to make an important, work-related, phone call, and Steven wasn’t there to be on kid duty. I did the normal mommy things: got the boys snacks and drinks, lectured on the importance of being quiet, reminded them I would be down the hall, turned on their favorite cartoon, and quietly slipped into my bedroom. I forgot something on my list though. Something VERY important. About halfway through this phone call, I needed to return to the kitchen to get something, though I’ve now forgotten what. I was definitely not prepared for what I found. That little mustard bottle? It was in the hands of my 2 year old. The contents of that bottle were all over my kitchen and dining area, and laundry room. I had forgotten to lock the refrigerator! The floor, the table, the chairs, the oven, the cabinets, the dirty clothes, the washing machine, both my sons…oh, and the couch, the carpet, two tote bags, a library book, and the dog – all decorated with spots, splashes, smears and puddles of yellow mustard. What’s a mom to do? I’m not even sure what I should have done. I couldn’t even give him a stern look though. I laughed. I told the woman on the other end of the phone what was going on. Thankfully she laughed with me. I then cleaned it up as I finished the conversation. Ah, you’ve never fully multitasked until you’ve undressed two little boys covered in mustard, cleaned up a ginormous mess, and carried on a business phone call at the same time! I get nauseas just thinking about the smell of mustard.. I would have lost it.